Ben Robinson|GoBuccs.com Covington wrestler David Robinson pins his opponent in a 145-pound match. Ben Robinson|GoBuccs.com Covington 152-pound wrestler Keringten Martin picked up his 150th win Saturday. 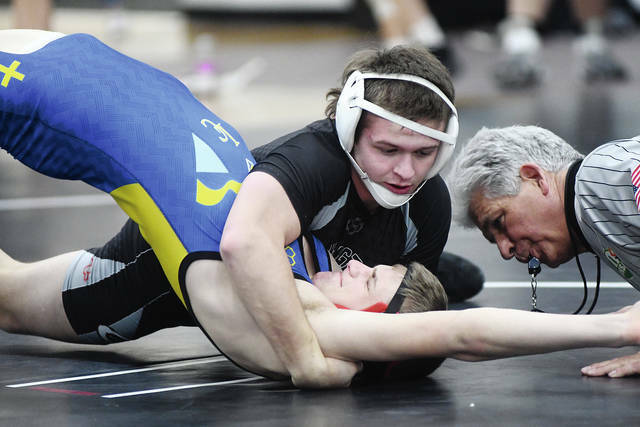 VANDALIA — The Piqua wrestling team competed at the GWOC wrestling tournament Friday and Saturday. Lance Reaves-Hicks (285) led the Indians, going 2-2. After losing by pin to Peyton Bartley of Xenia in the opening round, Reaves-Hicks pinned Chase Turner of Vandalia-Butler and Jokell Brown of Springfield. He, then lost a 7-3 decision to Wade Humphrey of Springboro. David Stumpff (113), Isaac Bushnell (170) and Bryce Short (220) all won matches, while Beth Herndon (132) also competed. After losing by pin to Michael Gust of Springboro, Stumpff won a 10-1 major decision over Logan Steiner of Lebanon before losing by pin to Ayden Tussey of Miamisburg. Bushnell pinned Karam Abuhelai of Wayne, before losing by pin to Nevan Snodgrass of Fairmont and losing a 6-3 decision to Gabe Wilson of Xenia. Short lost by pin to Tripp Johnson of Springboro, before winning a 9-7 decision over Cory Davis of Xenia and losing by pin to Bryan Sizemore of Troy. 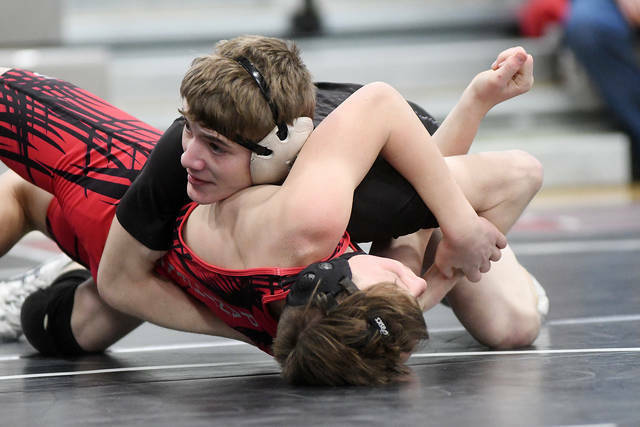 Herndon lost by pin to Matt Motter of Vandalia-Butler and Daniel Garlock of Lebanon. Piqua will wrestle at Troy Friday. COVINGTON —- Covington won the Covington Duals with a 47-30 victory over runner-up Miami East in the final round. The Buccs went 5-0 at the tournament with additional victories over Arcanum, 57-18, Lehman, 69-3, Tri-County North, 60-11, and Twin Valley South, 76-0. The wins improved Covington’s dual meet record to 25-4 this season. One of the highlights was Keringten Martin picking up his 150th win. Going 5-0 on the day for Covington were Kellan Anderson (106, 3 pins), Cael Vanderhorst (113, 3 pins), Austin Flick (138, 3 pins), Martin (152, 3 pins), Dylan Burns (160, 2 pins), Gavin McReynolds (182, 5 pins) and Jesse Fisher (195, 3 pins). Jensen Wagoner (145, 2 pins) finished 4-1 on the day, while Dylan Staudt (220, pin) finished 3-1. Going 3-2 were Connor Sindelir (126/132, 2 pins), Riley Richards (126/132), Trentin Alexander (170) and Clayton Stephan (285). Also winning matches and competing well for the Buccs were Fletcher Metz (145, 2 pins), Caleb Miller (138, 1 pin), David Robinson (145, 1 pin), Gavin Swank (152), Tyler Bauer (152), Bryce Smith (160, pin), Adam Brewer (170) and Scott Blumenstock (285). Covington travels to Tippecanoe for their final dual meet of the season on Wednesday. 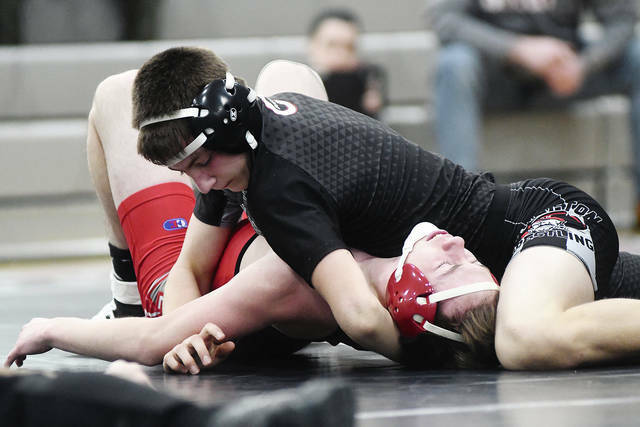 Wrestling starts at 5 p.m.
https://www.dailycall.com/wp-content/uploads/sites/30/2019/02/web1_david-robinson.jpgBen Robinson|GoBuccs.com Covington wrestler David Robinson pins his opponent in a 145-pound match. https://www.dailycall.com/wp-content/uploads/sites/30/2019/02/web1_keringten-martin.jpgBen Robinson|GoBuccs.com Covington 152-pound wrestler Keringten Martin picked up his 150th win Saturday.